Wild: Seeing the likes of Mammuthus steincaput alongside dinosaurs is still strange. Domesticated: Mammuthus steincaput is a difficult beast to domesticate. Not because they are inherently stubborn, but because knocking one out to begin the taming process takes forever. 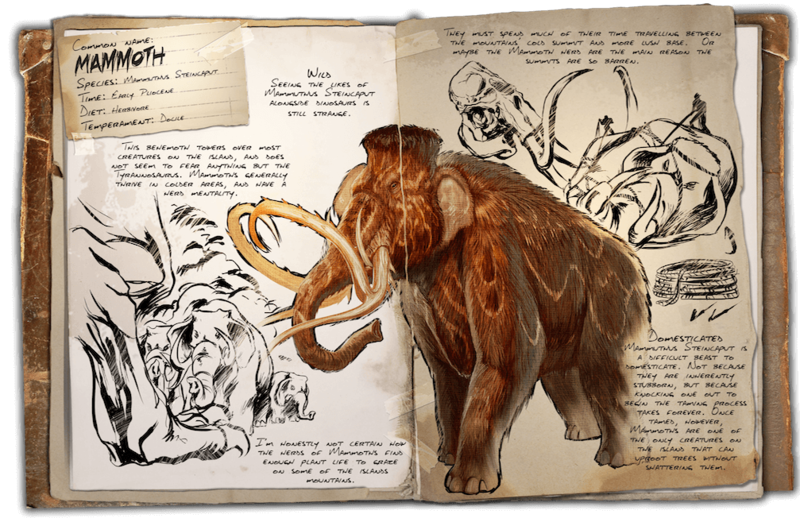 Once tamed, however, Mammoths are one of the only creatures on the island that can uproot trees without shattering them. Known Information: This behemoth towers over most creatures on the island, and does not seem to fear anything but the Tyrannosaurus. Mammoths generally thrive in colder areas and have a herd mentality. I’m honestly not certain how the herds of Mammoths find enough plant life to graze on some of the islands mountains. They must spend much of their time traveling between the mountains’ cold summit and more lush base. Or maybe the Mammoth herd are the main reason the summits are so barren.